(Sketch F No. 2) Preliminary Chart of the Entrance St. John’s River Florida. A rare hand colored 1853 costal chart of St. John's River, Florida. 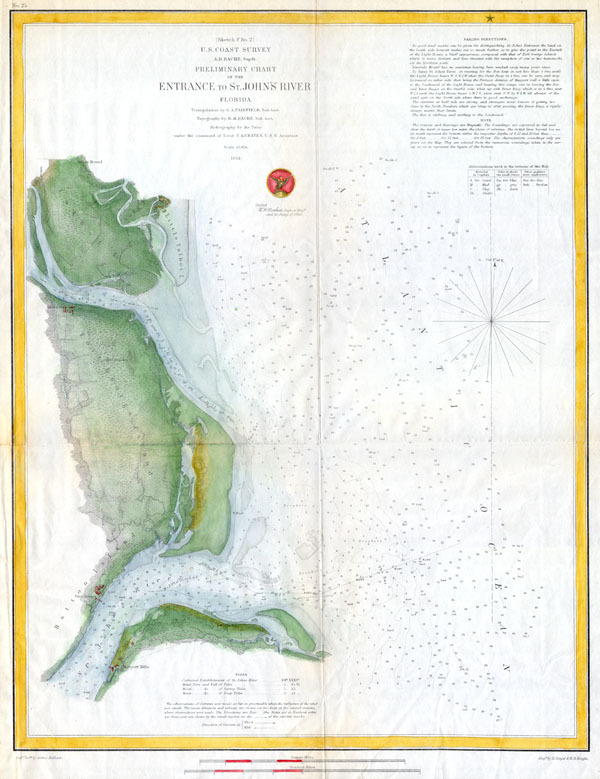 Chart offers superb inland detail of Fort George Island, Batton Island, Talbot Island, Long Island, Pilot Houses, Mayport Mills and Gibbs House, as well as sailing instructions and depth soundings well into the river proper. Triangulation was accomplished by G. A. Fairfield, topography by R. M Bache, and hydrography by T. A. Craven. Published under the supervision of A. D. Bache for the 1853 Report of the Superintendant of the U.S. Coast Survey. Library Company of Philadelphia, A Catalogue of Books Belonging to the Library Company of Phildelphia, p. 1362.